The Shaker's approach to simple, utilitarian design has led to increased popularity of their style over the years. 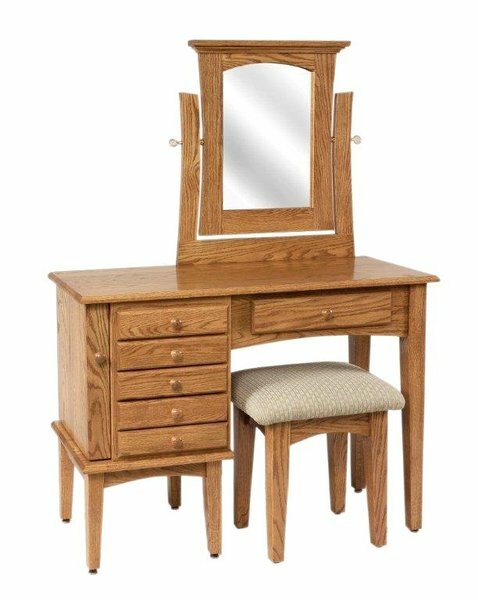 Following the same principles, our Amish handcrafted Shaker Jewelry Dressing table features clean, straight lights and subtle curves that will allow this piece to adorn any bedroom suite, also making it the perfect gift for that special someone. Bench built from solid hardwood, this American Made Dressing Table offers seven jewelry storage drawers and one necklace cabinet that is sure to hold all of your valuable jewelry and keepsakes. Included with the table, the matching Shaker style mirror will ensure you look your best before you head off to face the day or get ready for an evening out. Add the matching Shaker upholstered stool to complete the look.